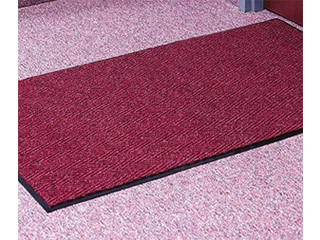 Description: Grime Fighter V-Track Scraper Mats will make an attractive addition to any entrance. It's classic "chevron" designed face pattern and extended durability make this perfect for light to medium traffic areas. 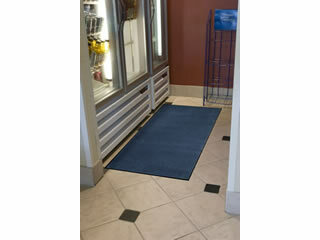 This mat is constructed of an extra durable 100% polypropylene surface with a heavy-duty vinyl backing. The raised chevron design promotes a safe non slip surface and acts as a scraper for removing dirt, sand and other debris from shoes. 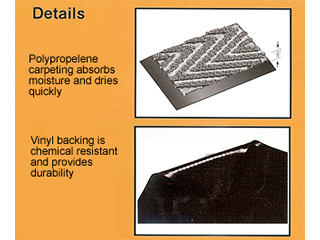 The polypropelene carpet absorbs moisture and dries quickly. Heavy duty vinyl backing is slip and stain resistant. Cleans dirt and moisture from shoes. Can be used on both carpeted or hard surface floors. Simply use a carpet cleaner or use a vacuum to clean.